We have something exciting here at Harry & David — our new Ruby Cacao Collection! 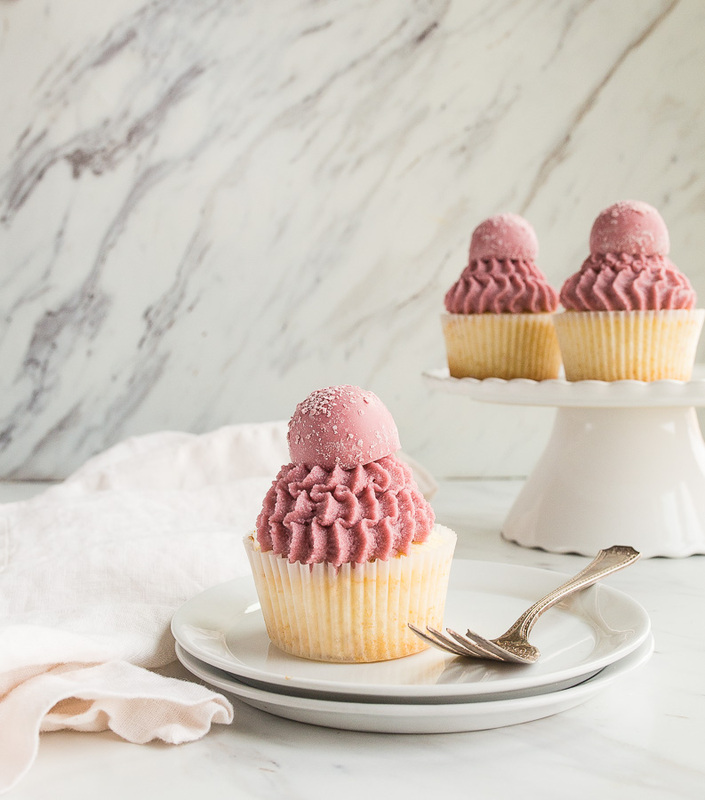 Christina from Dessert for Two is highlighting this delicious new confection with a delicate pink cupcake that you can share with the ones you love. It’s safe to say that Valentine’s Day is my favorite holiday. Perfectly portioned desserts and dinners for two is my thing and has been for over 10 years. 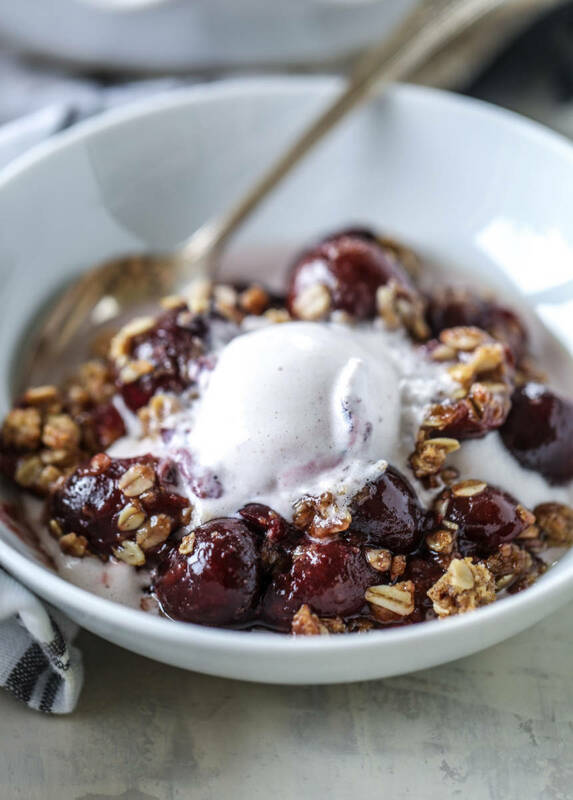 The idea of everyone coming together to enjoy a petite dessert for two makes my heart sing. I created this small batch ruby cacao cupcake recipe to serve two people, albeit very generously. The cupcake recipe itself makes just 4 cupcakes. The buttercream and Ruby Cacao Truffle on top makes these cupcakes rich and so delicious! Ruby Cacao Truffles are the perfect addition to your Valentine’s Day celebration! Click here to learn more about the ruby cocoa bean. The cupcake is a sour cream based cupcake with the flavors of almond and vanilla. I find that these delicate and light flavor combination allows the subtle berry flavor of the ruby cocoa bean to shine through. 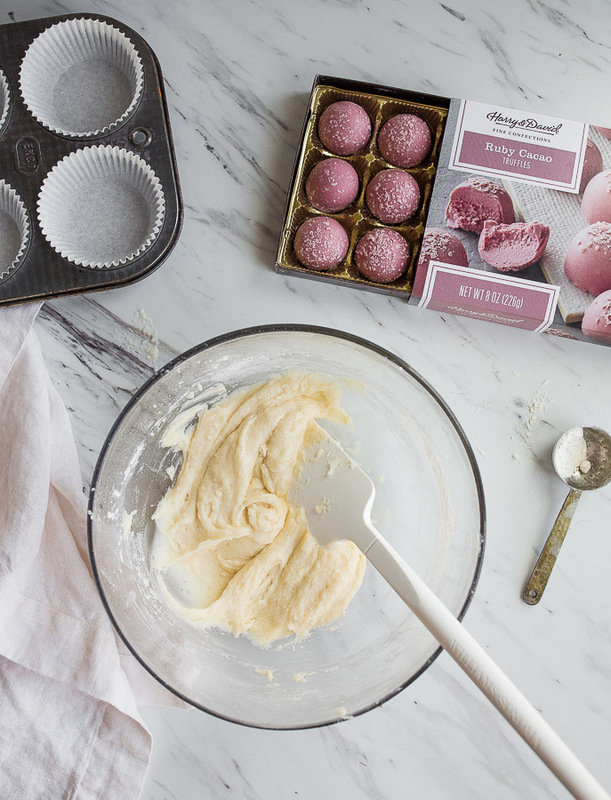 The buttercream frosting contains heavy cream to allow for fluffiness, but it also mellows the butter flavor so that the Ruby Cacao Truffle flavor can shine. However, it’s still sturdy enough to hold the truffle perched on top. It’s entirely optional to dye the buttercream the same shade as the truffles, but for me, one drop of blue gel food coloring and two drops of red food coloring made a perfect match. I hope your Valentine’s Day is a great one, and that these Ruby Cacao Cupcakes bring a big dose of love to your table! 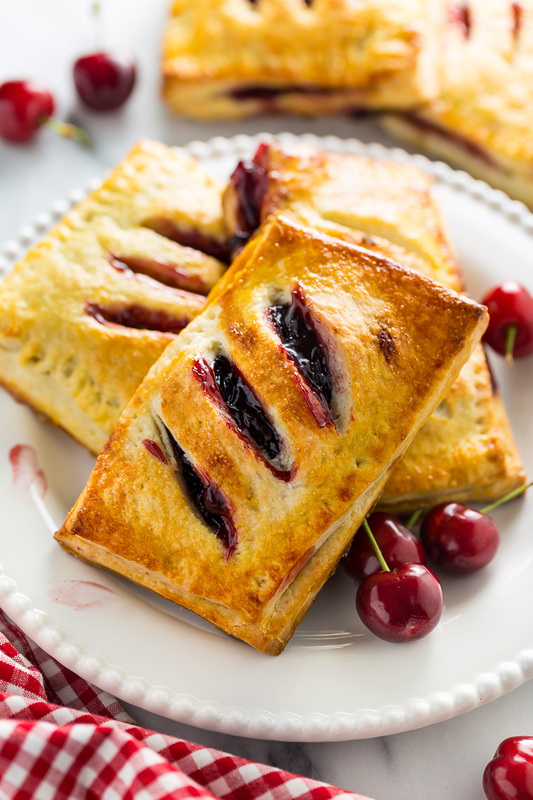 Preheat the oven to 350, and line four cups in a muffin pan with paper liners. First, make the cupcakes: In a medium bowl, beat with an electric mixer the butter, sugar, vanilla and almond extract. Beat until light and fluffy, at least 30 seconds. Add the egg white and beat until combined. Next, beat in the sour cream. Finally, sprinkle the flour, baking powder and salt evenly over the batter, and then beat until just combined. Divide the batter between the cupcake liners, and bake on the middle rack for 17-20 minutes. When done, the tops will spring back, and a toothpick inserted will come out clean. To make the frosting: beat the butter in a small bowl with an electric mixer until fluffy, about 1 minute. Add the powdered sugar, 1 tablespoon of the cream and the almond extract. Beat until very light and fluffy, about 1-2 minutes. Add more cream, if necessary. Finally, add the food coloring, if using. Scrape the frosting into a piping bag fitting with a large star tip. To make this shape, place the tip perpendicular to the cupcake, and squeeze with even pressure until a mound of frosting forms that begins to collapse onto itself. 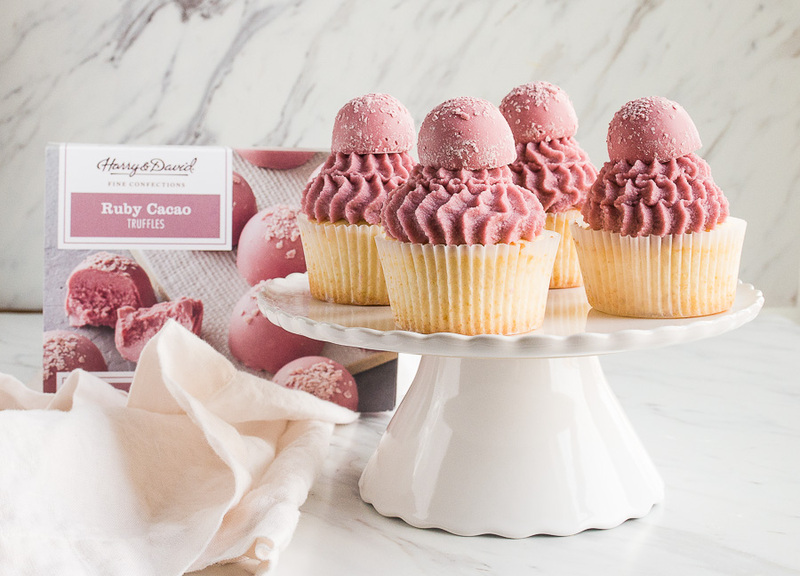 Place a Ruby Cacao Truffle on top of each cupcake and serve.